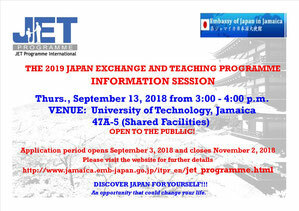 Japan Exchange and Teaching Programme (JET) Inforrmation Session at Utech on September 13, 3:00pm~4:00pm 47A-5. If you are interesgting in this programme, visit this session and feel free to ask questions. Your dream will come to you! !